Suggestions for planning a bubble-filled day, physical activities, creative recipes, crafts, and a new rhyme are all part of this fun theme! 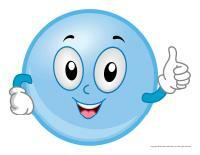 Word flashcards, coloring pages, puppets, posters, activity sheets, games, and so much more bubbly fun! 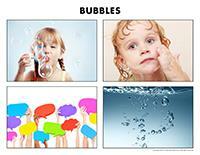 (Open thematic poster-Bubbles) Print, laminate, and display all kinds of posters. 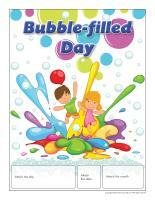 (Open educa-theme-Bubbles) Print and laminate the items that represent the theme. Use them to present your theme to your group (and parents) while decorating a corner of your daycare. Hang several pictures of bubbles as well as inflated balloons from the ceiling within your daycare. 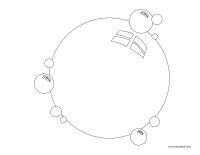 (Open models-Bubbles) Print and let children decorate the garland. Cut it out and hang it within your daycare or near your daycare entrance. (Open Poni discovers and presents-Bubbles) Print the various cards. Laminate them and cut them out. Use a Poni puppet or another puppet children are familiar with to present them to your group. The following tool was created in response to a special request received. (Open poster-You'll find us at the water games) Print and laminate the poster. Display it in a window or on your door when you are playing water games in the yard or at a nearby playground. The pictures may be used as a memory game or to spark a conversation with your group. Use them to decorate your daycare or a specific thematic corner. 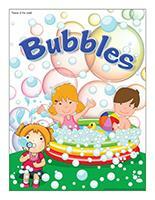 (Open picture game-Colourful bubbles) Print, laminate, and store the pictures in a Ziploc bag or in your thematic bin. 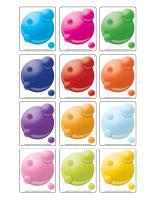 (Open picture game-Colourful bubbles) Print the pictures twice and use them to play a memory game with your group. 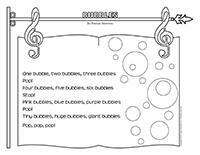 (Open activity sheets-Bubbles) Activity sheets are suggested for each theme. Print and follow instructions. 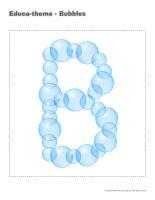 (Open writing activities-B like bubble) Print for each child or laminate for use with a dry-erase marker. 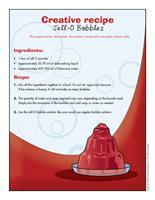 (Open educa-nuudles-Bubbles) Print for each child. Have children color the sheet and use Magic Nuudles to give it a three-dimensional look. Variation: You don't have Magic Nuudles? Have children fill the spaces designed for Magic Nuudles with bingo markers or stickers. To order Magic Nuudles. 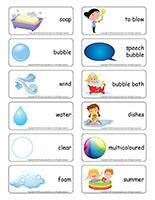 (Open word flashcards-Bubbles) Print and laminate the word flashcards. Display them on a wall, close to your circle time area or glue them on a large piece of cardboard that can easily be moved around. Name a word and ask children to identify the corresponding word flashcard. (Open perpetual calendar-Bubble-filled day) Print. 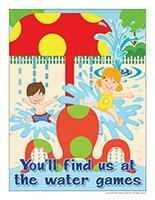 Greeting: Invite children to wear their bathing suit to daycare so they are ready to enjoy the day's activities. Circle time: Present a variety of pictures of activities involving water, bubbles, and bubble-making accessories. Lunch and snack time: Add a drinking straw to each child's glass of milk. Let them blow into their straw to make milk bubbles. Special activities: Set up a variety of different workshops that require foamy water. During summer, have fun washing your daycare bicycles and tricycles or even your car with your group. Fill a large container with a variety of objects that can be filled with water and emptied over and over again: sieves, funnels, etc. Use your water table to wash dolls. Provide soap and facecloths. You can also use your water table to wash doll clothes. Children will love hanging them on a clothesline to dry afterwards. Fill a large bowl with soapy water and add a few cloths. Encourage children to help you clean your daycare toys. (Open transition games-Bubbles) Print, laminate, and set the illustrations on the floor to create a path which leads to areas frequently visited by children such as the bathroom or cloakroom. If you prefer, the illustrations may also be used to delimit your various workshops. (Open transition games-Bubbles) Print two copies. Laminate and cut out the cards. Glue one copy of each card on the table using adhesive paper. Drop the other copies in a bag. Children take turns picking a card to determine their spot at the table for the day. You may also use the cards to determine naptime spots or for your task train. Cut circles out of several different colors of construction paper and set them on the floor. Each circle will represent a bubble. When you give the signal, children will have two minutes to collect as many objects they can of a specific color (determined by you) and deposit them on a bubble of the corresponding color. Add food coloring to your bubble solution and use it to blow colourful bubbles. 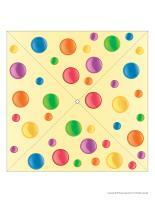 (Open game-Miniature bubbles) Print and laminate for durable, eco-friendly use. Provide colourful gift bags. Hide the miniature bubbles throughout your daycare. Each child chooses a bag and searches for bubbles of the corresponding color. Each time they find a bubble of the correct color, they must deposit it inside their bag. To increase the level of difficulty, you can use bags containing two colors. Inflate four or five balloons (different colors). The "bubbles" must never touch the floor! After a while, give children different instructions. For example, you may ask them to avoid touching the "bubbles" with their hands or to blow on them to keep them up in the air. Provide buckets filled with lukewarm soapy water, dish towels, rags, and facecloths. Let children wash your daycare toys. Blow soap bubbles for your group. Children will enjoy running after them and trying to catch them. They will also like trying to blow bubbles on their own. Blow soap bubbles for your group on a particularly windy day. Observe how quickly the wind blows them away. Divide your group into teams of two or three players. One child from each team shall play the role of a "germ". When you give the signal, the other team members (who represent bubbles) must wrap the germ in toilet paper for the duration of one song. When the music stops, the winning team is the one with the best-wrapped germ. Use a blow dryer to send round pieces of tissue paper (to represent bubbles) flying through the air. Children must catch as many as possible before they fall to the ground. Of course, children mustn't manipulate the blow dryer. Let a feather or sheet of paper fall to the ground. Children must sit down before the feather/paper touches the ground. Divide your group into teams of two children. Have both children from each team stand face to face and give them one ping-pong ball. Use colourful adhesive tape to draw a line on the ground, between team members. One child from each team blows the ball over the line, to his/her partner who must then blow it back. Where are the bubbles hiding? 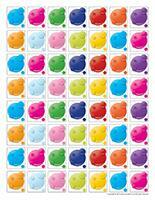 (Open game-Miniature bubbles) Print and laminate for durable, eco-friendly use. Hide the bubbles throughout your yard and invite children to search for them. Every time a child finds a bubble, he/she must run to deposit it in a basket before searching for another one. 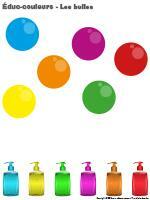 (Open picture game-Colourful bubbles) Print and laminate the bubbles. Arrange them on the floor of your daycare. To the sound of music, children must walk around the daycare. When the music stops, they must quickly find a bubble to stand on. 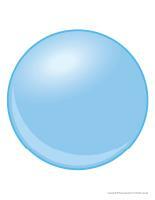 Variation: If you wish, you may also remove a bubble after each round to increase the level of difficulty. Several children will have to stand on the same bubble to avoid elimination. Provide three different colors of crayons: red, yellow, and green. Give each child a large piece of paper. Select music that contains a variety of rhythms (fast, medium, slow). Children must draw bubbles using the green crayon when they hear fast-paced music, the yellow crayon when they hear average-paced music, and the red crayon when the music is very slow. Blow bubbles and encourage children to catch them. Watch how surprised they are when the bubbles pop. Draw two lines on a table. Deposit a cotton ball at the beginning of each line. Children must blow on their cotton ball to make it reach the other side of the table. This very simple activity will help children evacuate any tension they may have accumulated during the day. We recommend that you present it before naptime or on particularly tumultuous days. 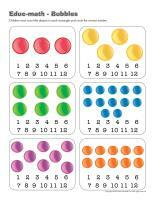 (Open educ-math-Bubbles) Print and laminate for durable, eco-friendly use. Children must count the objects in each rectangle and circle the corresponding number. 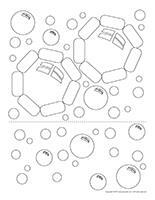 (Open memory game-Magnetic bubbles) Print two copies of each illustration and cut them out. Glue them on the top of frozen juice cans. Attach a magnet to the end of a fishing rod (a stick with a string tied to it). Set the illustrations face down on the floor and encourage children to take turns "fishing" two illustrations. If the two illustrations a child "catches" are identical, the child may keep them. Otherwise, he must put them back into play. (Open educ-colors-Bubbles) Print and laminate for durable, eco-friendly use. If you prefer, you may also choose to print the document for each child. Children must associate the items to the correct color by drawing a line using a crayon of the corresponding color (or another crayon). Collect tweezers, tongs, and pliers in different sizes. Empty a bag of colourful pompoms on a table to represent bubbles. Invite children to use the tools provided to grab hold of the "bubbles" and deposit them in a container. Children will enjoy the challenge this activity provides and work on their fine motor skills without even knowing it. On a windy day, take your bubble solution outside and explain to your group how the wind can be used to blow bubbles. Let children experiment and discover which method works best (how they must stand, the wind direction, the tool used, etc.). Gather a variety of objects and use a fan or blow dryer to try to make them fly away. Sort the objects into two piles: those that are able to resist the wind's force and those that can't. Add a drinking straw to each child's glass of milk and let them blow milk bubbles. This recipe must be used outside. The mixture is sweet and it can make surfaces sticky. Mix all the ingredients together in a bowl. Do no stir vigorously because if the mixture is foamy, it will not make as many bubbles. Combine water and corn syrup in a bowl and mix well. Slowly add the dishwashing liquid while stirring gently. The bubble solution may be kept for a long period of time in an airtight plastic container. ***Use outdoors because the bubbles may leave a sticky deposit when they pop. (Open puppets-Bubbles) Print the various puppet models on heavy cardboard. Ask children to cut them out and decorate the puppets with different arts & crafts materials. Stick a Popsicle stick behind each one to complete your puppets. 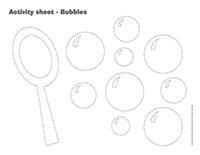 (Open models-Bubbles) Print the models and use them for your various activities and creations throughout the theme. Add a few drops of food coloring to your prepared bubble solution. Ask children to make their own bubble-blowing wands using pipe cleaners. Give each child a piece of white paper and ask them to blow bubbles on the paper. A pretty pastel-coloured design will appear. Fill an ice cube tray with water and food coloring and set it in the freezer until the ice cubes are ready. Set a large piece of white paper on a table. Deposit the colourful ice cubes on the paper and encourage children to slide them around to create bubble-like designs. Make your own whirligig (Open models-Bubble pinwheel) Print the model on heavy paper and cut it out. Cut the square along the dotted lines, working your way towards the centre. Fold every other tip toward the centre. Hold them together by inserting a fastener in the centre of your whirligig. When you are done, stick a drinking straw behind it. Children will have fun blowing on the whirligig. If possible, let them play with it outside. Encourage them to run around with it and watch it spin. 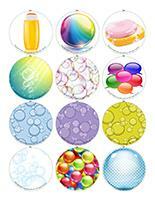 (Open coloring pages theme-Bubbles) Print for each child. (Open complete the drawing-Bubbles) Print for each child. Encourage them to add the missing items to complete the drawing.